Changing Patterns: You're Mad if you Don't React. The wine industry is made of family owned companies. Family owned companies seldom last past the 3rd generation in part because the family and business conditions that support the start of a business evolve over the years. Watching the clip above from MADMEN, you see the founder ask the question, "Why can't I just build on what I have?" The answer is a reminder that your customers needs and wants evolve, and you have to recognize and predict those pattern changes. To survive and adapt, a leader has to get out from behind the day to day world of running the business and ask tough questions about change. Today whether you are first or 4th generation, it's time to review the horizon because while the business continues to rebound, its not and wont continue in the same way it did in past recoveries as we discussed in Part I: The Long Term Future of US Wine Sales last week. Just what specifically will be different in this recovery for the wine business? Its too long of a topic to discuss on a Blog so much of this I'll reserve for the State of the Industry Report due out in January of 2013. But for now lets just start with one segment: planting .... and maybe a little on pricing because they are related. My good friend Bill Turrentine expressed the cyclicality of the Wine Business with his Manic-Depressive Wine Wheel. Its an excellent model explaining how the different constituents behave given changes in grape supply. In a time like now where we are trending to shortage with wine grapes, based on this model we should see the genesis of a planting explosion. But we aren't seeing that so its time to recognize changing patterns. Despite the Plaza Accords we discussed last week which devalued the US currency in the 1980's and started the downward evolution of the US$, the wine exporting countries of Chile, Argentina and those in the EU still share a common fate having a currency that is even weaker than the US$. Given the economic forces discussed last week, I believe that is likely to continue and will enhance the opportunity for those countries to import wine. Land values for comparable productive vineyards outside the US are generally less expensive than here. In the early 2000's, we pulled out more than 100,000 acres of producing vineyards that couldn't compete with cheaper foreign supply. That started a new pattern of importing foreign bulk wine intended for domestic labels; juice that in the past was sourced from the Central Valley. In the high production areas, planting decisions are not all about wine grapes either. Alternative permanent crops are at times more economical than grapes. There is no great rush to plant absent a long term contract versus what we have seen in the past. "A major consequence of the short California supply has been the tremendous growth of bulk table wine imports into Northern California, amounting to a staggering 36 million cases over the past 12 months." It's not just the current supply shortage that is fostering the growing bulk imports as Jon mentions here. It's a structural change as well that is caused by better access to foreign bulk today combined with favorable exchange rates. The importation of bulk wine will continue unabated as long as there is the ability to buy cheaper generic bulk wines that are perfect generic substitutes for Central Valley grapes. Planting will be restrained versus what we've previously seen in the past 20 years in the US. The solution I discussed in a prior blog is educating the consumer about the quality of California production wines to make them less prone to direct substitution from off-shore. Our farmers have more expensive land so the way to get a premium for the grapes is promoting the differences in US wine. I guarantee we aren't going to see a change in the pricing mechanism or obstructive and protectionist trade legislation. We can still influence buying patterns of our consumer and the emerging Millennials but leadership of that effort is going to have to come from within the growing community, most likely from the Central Valley. Fine wine production has at least an appellation component that can help beat back cheaper imports from our domestic consumers palates. You don't get Willamette pinot noir in Chile. The problem we face though is we are now in an era when the interwebs give information on pricing, quality, value, and location of the product. 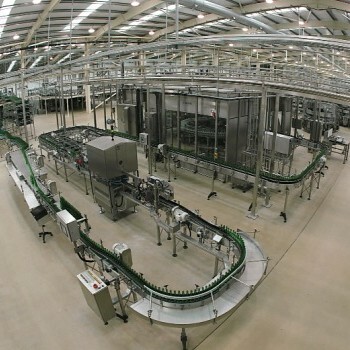 Consumers are able to use the computer to more efficiently compare domestic and foreign wines then have them shipped to their doors. That's a change from prior recoveries. Another change is several companies right now have, and many others are in the process of working on algorithms that better direct the buying decision of consumers .... if you like this wine, you'll love this one. Its not a brand new concept but the engines behind the initiative are growing more and more sophisticated. Put in the hand of a retailer, they will more effectively offer individualized choices that are offer the best margin for that retailer. That puts downward pressure on pricing as well for domestic producers. We can now have what we want, when we want it, AND a computer can now tell us what we will want at the same time. The odd coincidence is that the web provided a channel to sell wine, but also provides the information for a consumer to better drill down on pricing decisions and buy someone elses wine. So another major difference in this recovery is the availability of information and the speed in which its found, added together with the ability of wine to be shipped direct. In the past, if you wanted a foreign wine, you had to know the importer and had to drive to pick it up. Not so anymore. The wine can almost find you. While wine is a luxury good and the upper 20% of wage earners have done their job in the recent recovery, we are seeing growth rates in wide sales slow as we predicted in this years SVB State of the Industry Report. Among several reasons for that prediction, I believe we can't see sustained growth in the real price of wine paid without participation from the middle class and that's the rub today. We can and will grow in consumption by volume, but how can we grow from here in on price? As we said last week, the Middle-Class can't return to what we've experienced in the last 20 years. It is a shrinking segment as is the Boomer Cohort which has driven the past 20 years of pricing growth. Price increases are going to be difficult until we see some additional employment recovery. "Higher grape prices lead to higher land prices, lead to higher bottle prices. lead to higher grape prices." Its a nice cycle until one component breaks. In this case, its higher bottle prices. When we look at the chart to the left produced by Ian Malone ( ...I want him to be my friend so I can have three of them ...), you can see an intriguing trend. Over the recent past, the variation in the amount of non-bearing acreage on the North Coast of California is showing both reduced volatility, and lower net new plantings. This time, the opportunity to increase price dramatically isn't there given the state of the middle class. If there is no opportunity to increase price, that will impact some land values, and it will spur growth in lower priced premium appellations to the extent planting is required. If it is not, we can look again off-shore for producers to meet the demand of the fine wine consumer. Bottom line on planting, I don't believe we are going to see the aggressive planting we've had in the past because economics and the Internet favor growth in imports and that reduces the need for domestic supply. One path I see more of our clients take to account for this change is to consider getting land in other producing countries like Argentina and Chile, or look to some lower priced land to supply the volume needed for domestic wine at the right price. Please log in to the community and offer your opinion. What do you think? Too gloomy? What should a winery do armed with the vision of changing patterns? This week your guest moderators for the discussion will be that hard-working duo of Suzann Russell and Sara Chrisman from Silicon Valley Bank. Lets see how they deal with the heat? Please log in and fire away. One thing you're seeing in California is that grapes are gravitating to more "price-appropriate" wine programs. E.g., North Coast programs at $10/bottle are shifting to a California appellation, etc. You don't see fruit from premium regions available for bargain-basement prices going into lower-priced wines like you did several years ago. So wineries are shifting regions (and even shifting countries!). To me this is evidence the market is healthy and adjusting so that the right fruit gets into the right wines. I see the flood of bulk imports into the US as part of this readjustment process. I do wonder how long it can last though since there really isn't a limitless supply of the stuff and the central valley being more cost-competitive today. Thanks Ian for surfacing that supply side data. We can certainly corroborate having seen clients make these very decisions in sourcing programs for a positive impact on gross margin. IMO we will see new plantings pick up sooner than later. EU production is down, the competitive price advantage bulk imports historically held against Central CA fruit is softened (at least in the recent term with some reporting increases in price on foreign bulk), plus banks that pulled away from lending to the wine industry during the recession will likely want back in to some degree with record low interest rate environment fueling planting expansion throughout California. New planting regardless of long term contracts could become more attractive and prudent with favorable financing terms given long-term positive outlook on demand side for wine. 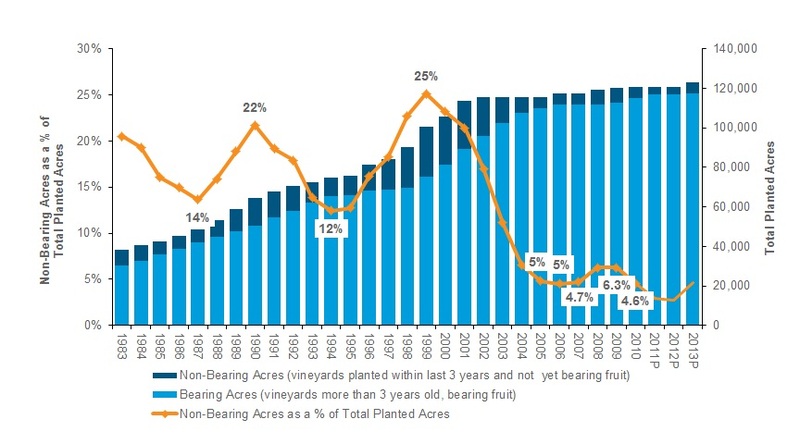 Big Wine with its sophisticated management and financial modeling could move to lock up land if CA planting boom begins. Lets double down on maybe not so fast. This new report from Ciatti shows real problems in major European bulk producers; lower volume and higher pricing. Bring that back to the argument made as well. Thanks for the thoughtful response. Yet again I am struck by another piece of commentary that global supply of grapes is on decline, which again impacts the supply/demand equation, calling into question that CA bulk can easily be replaced by the fungible global commodity. Without a doubt better branding of differentiated qualities in CA produced wine is a path out. The article you posted is compelling. I read another article on the topic today entitled “New World rises to the challenge of Europe’s poor wine harvest” http://www.reuters.com/article/2012/10/09/wine-harvest-americas-idUSL1E8L3JMJ20121009 however, I recognize that a good harvest in the fine wine regions mentioned in this article won’t likely be enough to compensate for the short harvest in Europe, and the article you posted basically said the same as well. Maybe we are indeed headed for an increase in global bulk wine prices sooner than I anticipated. Regarding your last comment about branding CA produced wine, I couldn’t agree more. Oh dear. Does this mean I'm not going to be able to buy my $7.99 Kirkland Signature Napa Chardonnay at CostCo for years to come? Your $7.99 Kirkland Napa Chardonnay may become a $7.99 California appellation Chardonnay! Thanks everyone for participating in the discussion. I've picked up a couple things to ponder and that's a big deal for me to have that kind of opportunity; for smart folks to disagree and add to the debate and by that, influence my thinking. And I'd add, aren't my colleagues smart? Those SVB bankers are pretty impressive and might I add, they are good and fun people too. I am blessed to work with them and thank Sara and Suzann both for standing in on the comments while I'm traveling.